As we have informed you previously, we are deeply saddened by the coup attempt in Turkey. Thankfully, it was thwarted by the strong will of the Turkish people. Unfortunately, this came with a severe toll on the lives of civilians and security forces. The ongoing situation after the coups is, however, equally frustrating. The following is an update we prepared for you on the recent developments. As you know, on the night of July 15th, 2016, a faction of the Turkish military began a coup against the current ruling administration in Istanbul and Ankara. The coup quickly unraveled and failed, leaving 265 dead, 161 of which were civilians and police officers, and over 1,500 wounded. What was Our Stance During the Coup? As Atlantic Institute, we publicly denounced the coup attempt as early as Friday July 15 when the coup was still in progress in full force. Who is behind the coup? We aren’t really sure, the coup was poorly planned, and executed by only a small faction of mid-ranking military personnel. What we do know, is that after the coup, President Recep Tayyip Erdogan alleged that the coup was orchestrated by the Muslim Scholar Fethullah Gulen and his supporters. In a show of power, Turkish officials have begun a “purge” at state and educational institutions of those they fear to sympathize with the Gulen movement. There have even been talks of reinstating the death penalty as a result of the coup. 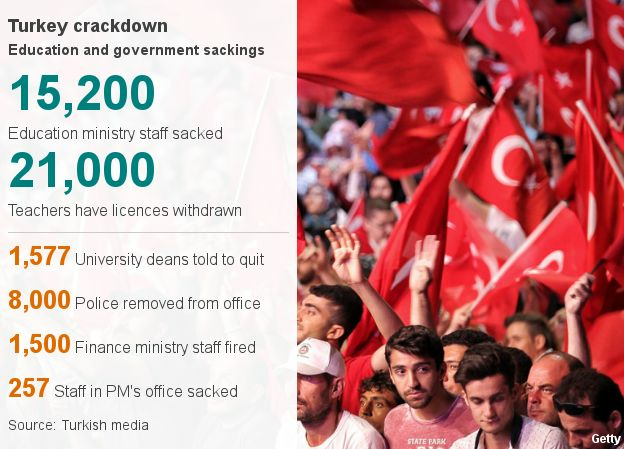 Read more about the full scale of Erdogan’s purge here [and Turkey Purge website that provides the most up to date numbers on how many people are affected by the post coup violations]. Who is Gulen and how is he involved in the military coup? As many of you already know, Gulen is a Turkish Muslim scholar living in a self-imposed exile in the United States. There is no evidence of his involvement in the military coup against the Turkish Government. Gulen has quickly condemned the coup, calling for an international investigation into the matter, hear his statements here. Turkey has formally requested Gulen’s extradition from the United States, however, Secretary of State John Kerry has expressed that the US would comply only if there was compelling "evidence" to suggest wrongdoing or crime committed by Gulen. Why did the coup happen in the first place? The response outside of Turkey overwhelmingly agrees that Turkey’s democratic institutions need to be respected and that change should occur within the framework of democracy and free and fair elections. Why do Erdogan and his Supporters blame Gulen? Gulen has become the default scapegoat for the current Turkish government because Gulen and his supporters are critical of what they feel is a shift towards authoritarianism by the ruling party in Turkey. This criticism alone appears to be the basis for scrutiny against Gulen and his supporters. Yet with the coup and state of emergency it turned into a full-fledged war against the opposition from all backgrounds, not just Gulen-inspired. It should be noted, that though the coup is over, the consequences and reaction to the coup is far from resolution. As the state of emergency is declared in the country, we are afraid that it has officially become "a crackdown of exceptional proportions." We are sincerely concerned that the crushing dissent in Turkey is turning into a witch hunt, will have an irreparable impact on political and social fabric. Destabilization in Turkey will also have enormous consequences for the rest of the region. Right now, Turkey is a key NATO ally, vital to containing the conflict south of its borders in Syria and Iraq as well. Additionally, Many Turks prided themselves with their country as a Muslim majority country for its successful democracy and flourishing economy as a role model in a volatile region. We want it to remain like that. Please pray for Turkey and its people and if you need additional information please do not hesitate to get in contact with us.